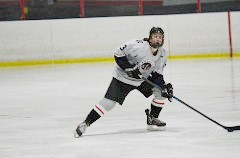 Atlanta Kings Excited to Announce Marc Baron Commits to Worcester State University! It’s been four long years but well worth the money and time spent for the Baron family. Marc Baron is the fifth King (formerly Knights) to commit to an NCAA D3 school. "It’s always a pleasure to see the reward after four long years", said Coach Kevin St Jacques. "Marc is a great defenseman. He’s been with me and this program for four years and every year he’s gotten better. I’m proud of Marc. He's had his ups and downs but kept fighting and believing in himself just as we believed in him!" Coach Kevin continues, "What is difficult for players to understand is the ongoing process for continual development. Each year a player has to get better, stronger, faster and it just doesn’t happen overnight." "I am very thankful to the Atlanta Knights organization, coaches, billet families, my parents and teammates for the last four years in Juniors", Marc stated. "Your guidance and support has allowed me to grow as a player and individual. I’m looking forward to moving on to the next level at Worcester State." Coach Kevin commented, "It’s the best feeling or reward to hear the gratitude when parents and players say 'Thank you coach!'. All the coaching, developing, time and money means nothing until that player commits." Coach Kevin continues, "It’s a special time in our program. We are getting ready to go into a new facility, new name, new logo. No better way to end the Knights era than to have so many players commit this year! A lot of people in our area believe we don’t send kids to colleges so this pretty much debunks that theory! Every year we have sent players to D3 NCAA or ACHA D1/D2." "Finally, I’d like to thank the Baron family for putting their trust in the Knights program and in Scott Hilton and my coaching for the last four years. We wish Marc the best and would like to congratulate him again on his commitment!' summed up Coach Kevin.